Ram Bahadur Gurung recycles cloth, creating new from old. The PPP for 4Gs project is helping him do the same with his business. Twenty years ago, when Ram Bahadur Gurung was visiting China as an aide-de-camp to then Nepalese Crown Prince (later King) Dipendra, he came across a cloth recycling machine. He marveled at this simple technology and thought about what lucrative opportunities it could create if it were introduced in Nepal. 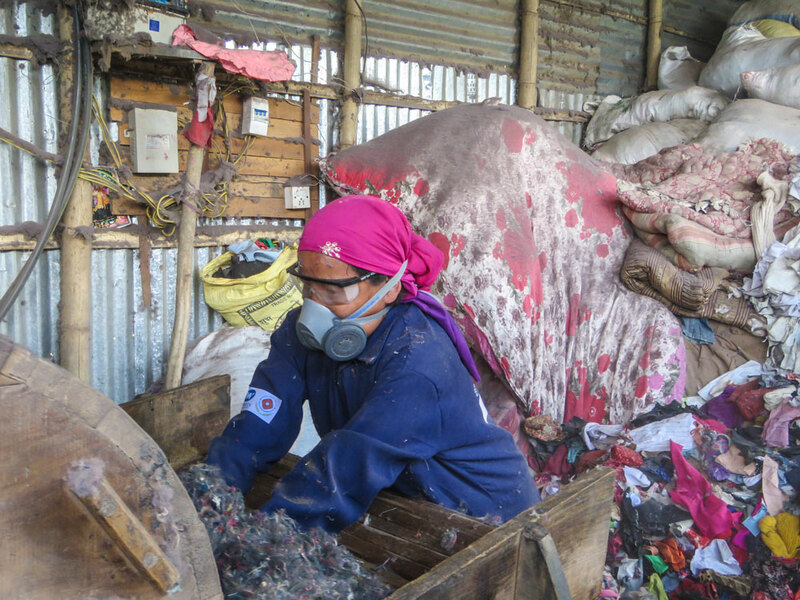 The cloth recycling business worked like this: Gurung would buy unwanted clothes, paying $10 US for each 12-kilo batch and seven cents per kilo for waste clothes collected from the market. He would sort through the clothes, removing anything metallic as well as water-repellent fabrics, leather and buttons. Then he would shred the clothes, creating a wadding of processed cotton that could be fashioned into cushions, blankets, mattresses and pillows, whatever his customers required. 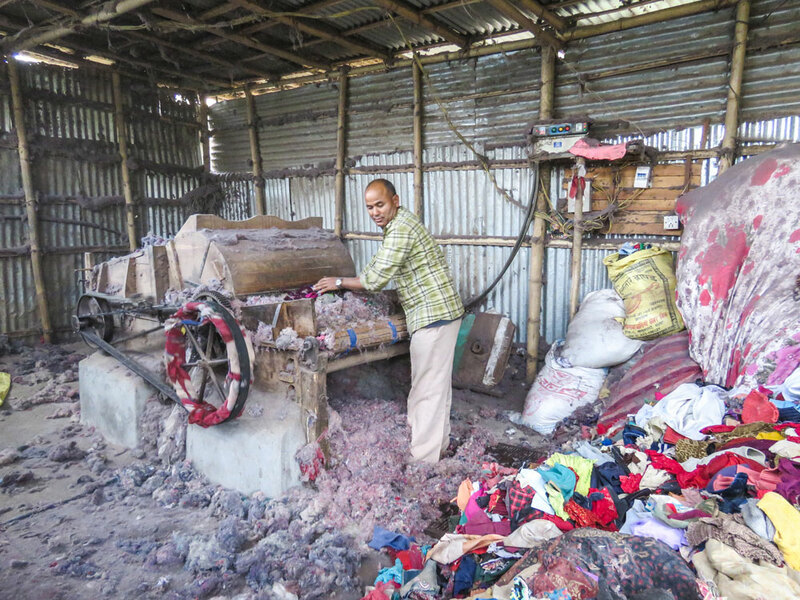 Ram Bahadur Gurung at his cloth recycling business in Ilam municipality in Nepal. His business, Trishuli Kapas Prasodhan Udhyog, is a key stakeholder of the PPP for 4Gs ( Switch Asia) program. Gurung was proud of his business. The operation was smooth, and his customers were satisfied. He had 16 employees. But the massive earthquake of April 2015 turned Gurung’s factory and house to rubble, and the frequent aftershocks forced him to move from the Nuwakot district to Ilam, almost 600 kilometers away. The earthquake did not extinguish Gurung’s entrepreneurial spirit, though. Soon after moving to Ilam, Gurung reopened his factory there using $15,000 US from a welfare fund established by the Nepali army. He leased land, built an infrastructure, and bought a machine to start over again. Despite the slow bureaucratic pace and an unreliable power supply, Gurung managed to start the new operation in May 2016. 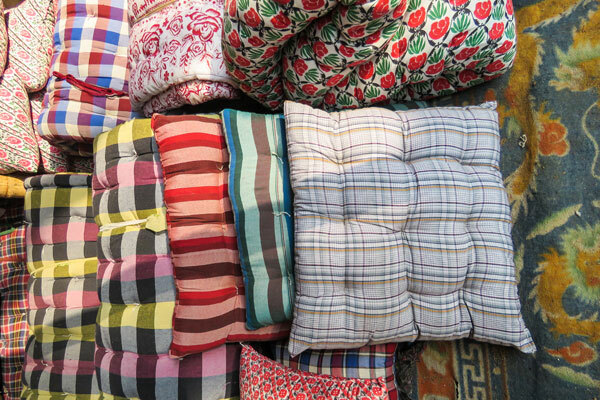 The cotton wadding made from shredded clothes is used to stuff cushions, blankets and mattresses. “My objective behind recycling old clothes is to provide environmentally friendly and affordable bedding, quilts and other products to people — even those with compromised economic conditions,” he says. Plus, he once again provides employment to others — seven women and two men. While his income has yet to compare to what he was making before the earthquake, Gurung is hopeful it will increase. Meanwhile, he takes pride in the employment he offers and the income he generates. He’s also glad to contribute to sustainable consumption and a cleaner environment in Ilam Municipality. Gurung’s Trishuli Kapas Prasodhan Udhyog is a key stakeholder of the PPP for 4Gs (Switch Asia) program, which is funded by the European Union and implemented by Winrock. PPP for 4Gs offers a sustainable approach to solid waste management through public-private partnerships that mobilize small- and medium-sized enterprises with relevant trainings, initiatives for stable market linkages and access to funds that will help businesses expand. The PPP for 4Gs project allowed Gurung to buy safety equipment for his employees. Trishuli Kapas Prasodhan Udhyog has taken advantage of the project’s exposure visits, business and financial planning, and work environment improvements. The project has also helped Gurung provide occupational health and safety equipment to his employees. “I am happy to receive equipment support from the project because previously excessive dust inside the factory was unbearable for my employees, the bare-hand use of machines resulted in injuries, and particles irritated my employees’ eyes,” Gurung says.